The technology for storing data continues to bring us ever-increasing capacity. First there was CD-ROM discs, next the DVD-discs, which increased capacity and data transfer speed. Now we have blu-ray discs that provide 100 GB of storage. Blu-ray Discs (BD) were introduced by Sony in October 2000. Even though this new technology was developed for the consumer market, it also was capable of handling computer data. As a matter of fact, Blu-ray became the standard in both markets. In the early days of optical discs, there were other formats such as UDO from Plasmon and HD DVD jointly developed by Toshiba and NEC. Blu-ray discs won the battle of the formats because of the consumer demand for this type of disc. The name Blu-ray Disc is derived from the blue-violet laser used to read and write this type of disc. Because of its shorter wavelength (405 nm), substantially more data can be stored on a Blu-ray Disc than on the DVD format, which uses a red, 650 nm laser. Originally Blu-ray Disc could store 25 GB on each layer, and now they can hold 100 GB. They actually compete favorably with tape, costing about the same per megabyte. The advantage is that the optical media is archival, lasting for over 50 years. A current, single-sided, standard DVD can hold about two-hours of standard-definition movie with a few extra features. But a high-definition movie, which has a much clearer image, takes up about five times more bandwidth and therefore requires a disc with about five times more storage. Discs store digitally encoded data, video and audio information in pits — spiral grooves that run from the center of the disc to its edges. A laser reads the other side of these pits — the bumps — to play the movie or program that is stored on the DVD. The more data that is contained on a disc, the smaller and more closely packed the pits must be. The smaller the pits (and therefore the bumps), the more precise the reading laser must be. 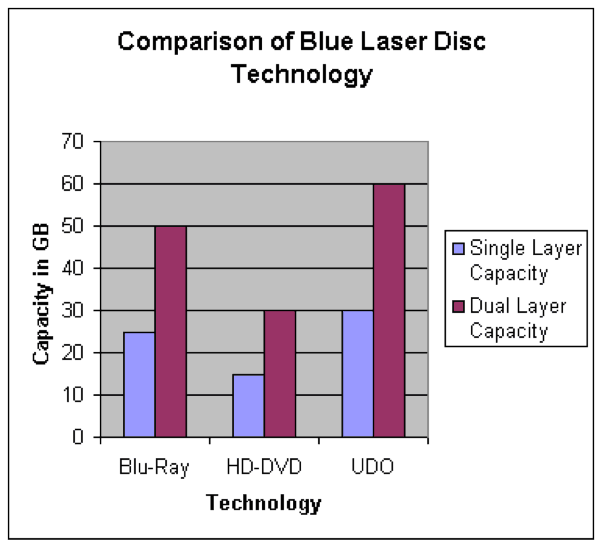 Unlike current DVDs, which use a red laser to read and write data, Blu-ray uses a blue laser. A blue laser has a shorter wavelength (405 nanometers) than a red laser (650 nanometers). The smaller beam focuses more precisely, enabling it to read information recorded in pits that are only 0.15 microns (µm) (1 micron = 10-6 meters) long — this is more than twice as small as the pits on a DVD. Plus, Blu-ray has reduced the track pitch from 0.74 microns to 0.32 microns. The smaller pits, smaller beam and shorter track pitch together enable a single-layer Blu-ray disc to hold more than 25 GB of information — about five times the amount of information that can be stored on a DVD. Each Blu-ray disc is about the same thickness (1.2 millimeters) as a DVD. But the two types of discs store data differently. In a DVD, the data is sandwiched between two polycarbonate layers, each 0.6-mm thick. Having a polycarbonate layer on top of the data can cause a problem called birefringence, in which the substrate layer refracts the laser light into two separate beams. If the beam is split too widely, the disc cannot be read. Also, if the DVD surface is not exactly flat, and is therefore not exactly perpendicular to the beam, it can lead to a problem known as disc tilt, in which the laser beam is distorted. All of these issues lead to a very involved manufacturing process. The Blu-ray disc overcomes DVD-reading issues by placing the data on top of a 1.1-mm-thick polycarbonate layer. Having the data on top prevents birefringence and therefore prevents readability problems. And, with the recording layer sitting closer to the objective lens of the reading mechanism, the problem of disc tilt is virtually eliminated. Because the data is closer to the surface, a hard coating is placed on the outside of the disc to protect it from scratches and fingerprints. The design of the Blu-ray discs saves on manufacturing costs. Traditional DVDs are built by injection molding the two 0.6-mm discs between which the recording layer is sandwiched. The process must be done very carefully to prevent birefringence. The two discs are molded. The recording layer is added to one of the discs. The two discs are glued together. Blu-ray discs only do the injection-molding process on a single 1.1-mm disc, which reduces cost. That savings balances out the cost of adding the protective layer, so the end price is no more than the price of a regular DVD. Blu-ray also has a higher data transfer rate — 48 Mbps (megabits per second) — than today’s DVDs, which transfer at 10 Mbps. A Blu-ray disc can record 25 GB of material in just over an hour and a half. If you would like more information about any of the technologies described, please contact us at 1-800-431-1658 in the USA or 914-944-3425 everywhere else. You can also use our contact form.